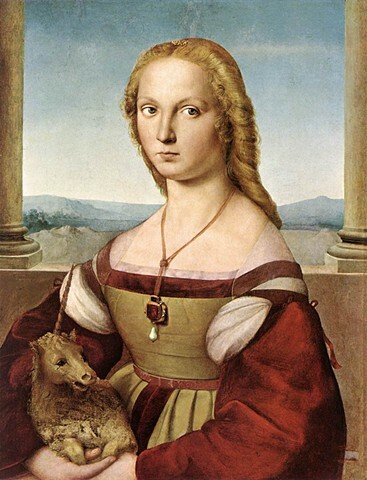 Lady with a Unicorn, is a photographic self-portrait in the style of Raphael's little known painting of similar name, created almost exactly 500 years later. After seeing the painting in the Borghese during a trip to Italy, the artist was captivated by the unusual, tiny unicorn, and after some research discovered that the painting had gone through a series of fascinating metamorphoses. In 1934-36, the painting—formerly considered to be a portrait of St. Catherine by Perugino—was restored, with a heavily repainted Saint Catherine's Wheel was removed to reveal the tiny unicorn. (A gruesome aside: Catherine's Wheels, also known as Breaking Wheels, were a medieval torture device used for capital punishment from antiquity until worryingly recent times—as recently as the 19th century in Germany. Victims were lashed to a large wooden wheel and beaten with a cudgel, the spaces between the many spokes allowing the bones to break.) The story of St. Catherine has her martyred on the wheel that bore her name, hence its presence in the re-painted image, which remixed Raphael's intended work. The unicorn revealed by this process, also helped to confirm the painting as authored by Raphael. Traditionally a symbol of purity or virginity, the unicorn's diminutive appearance is as much a mystery as the identity of the woman. And beneath the unicorn lies yet another layer revealed by X-ray; a dog was our lady's original companion. Using only clothing from her own closet, the artist restaged the image, with yet a further removal. Unicorns, a childhood obsession have vanished in this adult world, and the lady's arms are empty. But unlike the martyred Catherine, or the painted bride, this woman's eyes confront the camera, claiming authorship of herself in this magicless world—but hinting at the power of the imagination to conceive and reconceive of self.